I am feeling very fortunate to again be learning with Silvia Tolisano and adding to my repertoire of communication tools and digital literacy. The challenge of the moment (outside of writing a blog post on the dime), is trying my hand at sketchnoting. I believe without yet truly studying its function that sketchnoting is an tool that will allow me to create customized, colourful and artistic visuals. 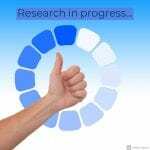 I’m sure it has limitless applications and I look forward to exploring what it can mean for my communications, or as Silvia explains with making thinking visual. If you too are a beginner, Sunni Brown’s book the Doodle Revolution and Sylvia Duckworth’s How to Sketchnote: A Step-By-Step Manual for Teachers and Students are great springboards. Sylvia Duckworth also shares these valuable Google Slides on launching your sketchnote efforts: Sketchnoting for Beginners. It is amazing to witness the endless creativity and depth of thought that work in tandem when Sketchnoting. 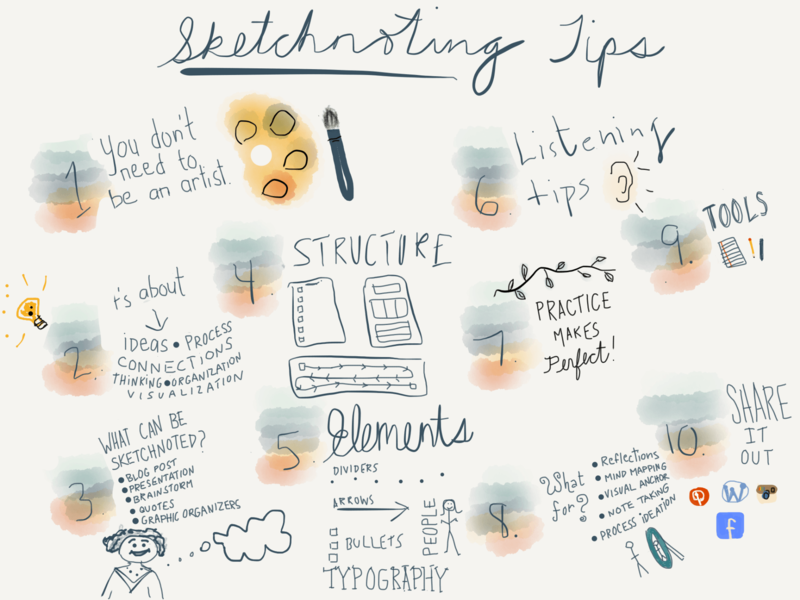 Silvia anchored our first attempt at sketchnoting in creating a sketch featuring 10 Sketchnoting Tips. We used the app Paper by WeTransfer which had several free tools available. Here is my first creation. I have to say that I found this exercise exciting and loved the challenge of capturing ideas and reflections in one visual. I experimented with fonts, pictures, icons, overlaying, the watercolour feature (which was my favourite) and capturing my ideas succinctly. I will absolutely revisit sketchnoting and would really like to see what unlocking the other features would invite to the creating. I would also like a fine-tipped stylus tool so that I can really draw in a more detailed way with more control. Also, time to find my flow. I can see that proficiency would allow me to sketchnote in the moment with info informing what I am committing to the sketch (i.e. in a lecture or note-taking at a meeting). As a novice, I will need more time to better understand all of the ins and outs. Especially not accidentally erasing part of my sketch by smudging with my hand (left-handers beware), which seems to have inadvertently affected tip #2 of my sketch. As an educator, I think this would help students, but again, they would need time to first plan and then really create. I wouldn’t want to create frustration by having a lofty goal as they explore the possibilities. This would invite opportunities for students at a beginner level to create art, as a mind-mapping opportunity, to make cards or invites, posters, as well as capture their favourite quotes. I think it could be used as a tool to help a student re-regulate. It could then after practice be used for mind-mapping and planning out stories, taking notes and other more intensive purposes. I certainly look forward to practicing and also identifying ways I can sketchnote at school with other educators and students. No question it is a great addition to my digital literacy toolbox. This entry was posted in Documenting Learning, Sketchnoting, The_OJCS by kereng. Bookmark the permalink. I am glad you liked the sketchnoting activity… the possibilities are truly endless how to further explore the concept of making thinking visible, as well as the act of doodling improving memory, creativity and mindfulness. I can attest with my sketchnoting journey (off and on for the past 5 years), that the focus is not always the same for me. It evolves and deepens or also takes off on different tangents with different goals (not always intended). All I can say is that sketchnoting has been one of the most intriguing thinking and learning processes EVER for me. One that I would have never anticipated nor envisioned. Silvia Rosenthal Tolisano on First Pineapple Party! Silvia Rosenthal Tolisano on Diving in!